Dave Brock is the founding father of the whole space rock genre. Oh sure, there may have been a track here and there on a rock album prior to Hawkwind's self-titled debut back in 1970 that touched on the subject of rockets and space travel. But it wasn't until Hawkwind emerged out of the chaos of the late sixies psychedelic scene in London's Ladbroke Grove that a rock band embraced the themes, sights and sounds of science and science fiction to the extent of creating a sub-genre in the rock idiom: "space rock". 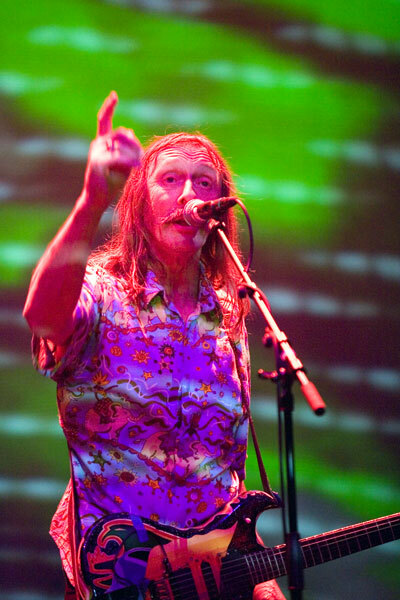 Through Hawkwind's 37 year long career Dave Brock has been the band's one constant member and defacto leader, serving as singer, guitarist, synth player, keyboard player and songwriter. Hawkwind have gone on to inspire a myriad of other musicians. Most of the bands covered by Aural Innovations, like Spacehead, Ozric Tentacles, Darxtar, Farflung, Pressurehead, Helios Creed, Chrome, Jet Jaguar, Acid Mothers Temple, The Spacious Mind, Mr. Quimby's Beard, Secret Saucer, Quarkspace, Architectural Metaphor, Alien Planetscapes, and literally dozens of others, owe something to the decades long influence of Dave Brock and company and their intergalactic musical explorations. 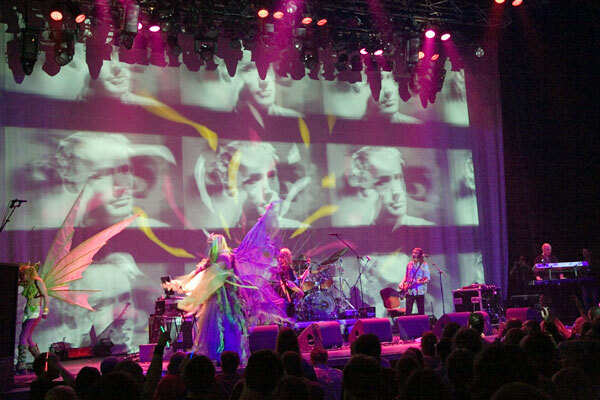 This year Hawkwind played the headlining set on the mainstage at the Roadburn festival. As expected they rose to the occasion and put on one of the finest performances I've gotten to witness in my 30 years of seeing them live. Kris Tait, Hawkwinds wonderful, accommodating, and always friendly manager, was able to arrange for Dave Brock to take some time out of his always busy schedule to answer a few questions sent to him online about his and Hawkwind's future exclusively for Aural Innovations readers. Here's what Mr. Brock had to say about the recent Roadburn festival and some things to look forwards to. Eli Friedman (EF): Roadburn was my first time seeing the band with Jason Stuart on keyboards, other than on the DVD that came with Take Me to Your Leader. How did you discover him? Dave Brock (DB): He played keyboards with The Captain Rizz band who supported Hawkwind a couple of times. EF: It seems like now with a dedicated keyboard player your guitar playing role in the band gets pushed a bit more center stage. I like that aspect of this newest configuration. What are your thoughts about working as a guitarist with a keyboard player in the band? DB: There's less pressure on me to play keys and sequences. 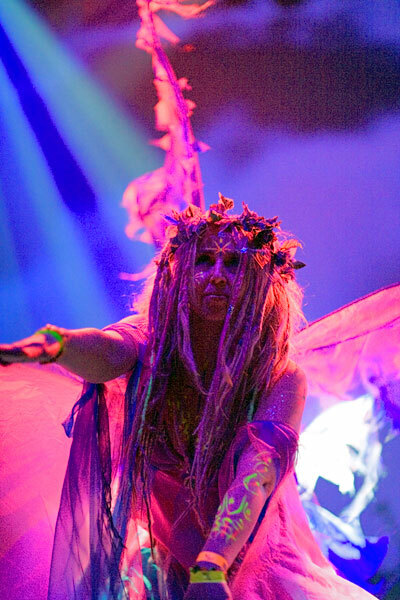 EF: Could you comment on how so many of the Hawkwind songs in the setlist at Roadburn that were written in the seventies, like most of the best classic rock from that era, still sound magically timeless and yet frighteningly relevant thirty years and more down the line? Spirit of the Age, Hassan I Sabha, or Psi Power could have been written yesterday. DB: Humans are slow to evolve. EF: The dancers that were at Roadburn were great. Who are they? DB: Stripey and Snail from York (and Fairy Jane). EF: Who did the fantastic light show at the festival? What an amazing presentation! DB: Chaos Illumination (Neil, Marie and John). EF: Was your performance at Roadburn filmed, and if so, do you have any idea how it might be released in the future? EF: Can you tell us a little about the recently announced "Take Me To Your Future" dual disc. Can you tell us anything about some of the new songs and what the video content is all about? DB: Well it should have been out by now. Some material from the TMTYL sessions and live shows yet to be released. EF: Is there an anticipated DVD release from either of the Hawkfests? DB: Yes, we're just waiting for film edits. EF: Kris Tait (Hawkwind's manager) had mentioned the possibilty of Hawkind actually making a return to the U.S. in November 2006? Is there hope for your U.S. fans to hold on to. What's the skinny on a future U.S. tour? DB: We'd like to play, but what a nightmare of paperwork for entry to the US. It all becomes so much trouble. However we are discussing some dates for the end of the year. EF: Any other live plans for the year? DB: Yes, various festivals in the UK, France and Finland. EF: In previous interviews you had mentioned a project of putting Calvert recitations to new backing tracks. Will that see the future light of day? DB: Yes. Its all done and waiting for release. EF: Will there be more archival releases of live Hawkwind concerts coming from Voiceprint? DB: Yes, we have some exciting good recordings. EF: Are there any other new Hawkwind or Dave Brock CD's or DVD's coming down the pipeline that fans can look forwards to? DB: Only the Calvert project which is waiting for release. EF: The past year has seen the release of two popularly received books that tell the history of Hawkwind from two different authors. I thought that while Ian Abrahams was able to tell a somewhat balanced account of the band's history, the Carol Clerk book was coming from a darker place. Her account is full of the sound of axes grinding. Have you read the books? Is there anything about them you wanted a chance to get off your chest? DB: Yes, I've read both... rather an invasion of privacy and I'm most disappointed with some ex-members who seem to forget what wonderful times they had..... and that they got paid. EF: I saw a new CD in the European shops during my Roadburn sojourn purporting to be Hawkwind-Empire Pool Wembley 1973-The Complete 78 minute show. I couldn't find the name of the label? Any info on this release? EF: Dave, thanks so much for taking the time out for this. I very much appreciate it. Thanks for a fantastic gig at Tilburg... you guys just keep getting better. It's amazing. I loved it. I hope you'll be able to arrange something in the U.S. this year and I'll have another opportunity to see you soon.